Hatch is published by the journalism students of Macleay College in Sydney and Melbourne. WINNER “BEST PUBLICATION” – 2018 OSSIE AWARDS. Eight days of competition. Eighteen nations. Eleven sports. Over 500 athletes. A thousand volunteers. This is the 2018 Invictus Games, being hosted right here in Sydney. The Games, which begin on Saturday (October 20), aim at showcasing the fighting spirit of injured and disabled service personnel (“Invictus” is Latin for “unconquered”). They were founded in 2014 by Prince Harry, the Duke of Sussex, who was inspired by watching the 2013 Warrior Games in the US, and will be launched by him on Friday night when he climbs the Sydney Harbour Bridge to plant the Invictus flag. When the Duke launched the Invictus Games Foundation ahead of the first Games in London, he spoke about the positive effect sport could have on the recovery of servicemen and women. “I have witnessed first hand how the power of sport can positively impact the lives of wounded, injured and sick servicemen and women in their journey to recovery,” he said. The eight-day Sydney Games will begin with an opening ceremony on the Opera House forecourt. Prince Harry and his wife Meghan Markle, who are on their first Australian tour, will be attending. 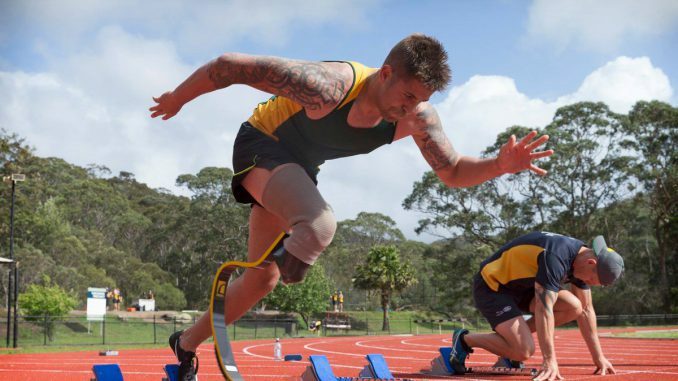 The Australian team has 72 serving and former military personnel competing across 11 adaptive sports, at venues comprising Sydney Olympic Park, the Sydney Opera House, Sydney Harbour, the Domain and the NSW Golf Course. “Sport gives me the motivation to get moving,” says one of the team members, Corporal Sonya Newman, who has one leg amputated above the knee. She is competing in swimming, wheelchair basketball, indoor rowing and sitting volleyball. The Games embody the spirit of being unconquered through recovery and rehabilitation, as well as raising awareness of and respect for people who have served the country. Another Australian team member, Mathew Blunt, who is competing in archery and wheelchair rugby, received back injuries when his vehicle rolled over during a training exercise. He also suffers from PTSD and depression. Blunt says: “Getting back into sport has helped me get out of the house and meet new people. I struggle to get out of bed daily and sport gives me something to focus on.